I have trained this week…. …. since I got back from Oman a week ago. Sometimes it seems tough to get back into it properly after travelling though, which is odd as I trained while I was away. A week of heat, working long days, travelling, and the odd beer in the hotel bar is obviously tiring though. I’m not sure what happened to Thursday then. I didn’t get time to train at work, and plain forgot in the evening. Gradually negative split from a 1:50.0 first 5mins to a 1:44.8 last 5mins. Felt really good today and relatively easy, so I think I’m back into it now. 3 weeks tomorrow to the Farnborough 5k, and so 3 weeks Sunday to the pairs 100k. I haven’t blogged for 10 days but I’ve not been lazy. Training in the heat of the Oman desert hasn’t been easy though. Rather than split up the training and the week away I will blog as a photo diary of the week and include training where it was done. Thursday 15th: Flew from Heathrow to Muscat via Abu Dhabi. Very lucky to get out of Heathrow less than 2 hours before it closed completely – the departures board was a sea of red cancellations as I sat waiting for my flight. The overnight stop was spent in the Intercontinental hotel, which for anyone travelling in that direction has 4 good condition Model D’s in the gym. I gave my colleague who I was travelling with a first coaching session to hopefully get a training partner for the week. 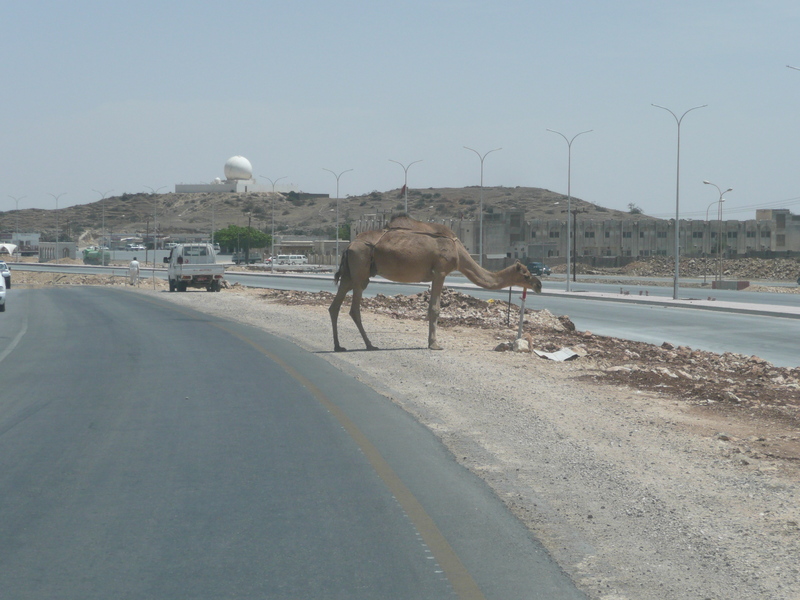 Friday 16th: Continued the journey on to Salalah over in the west of Oman. The plan was one night in the Hilton before moving on to the final destination by road on Saturday. The Hilton was right on the beach on the Indian Ocean with a nice beach restaurant that we ate in that evening. 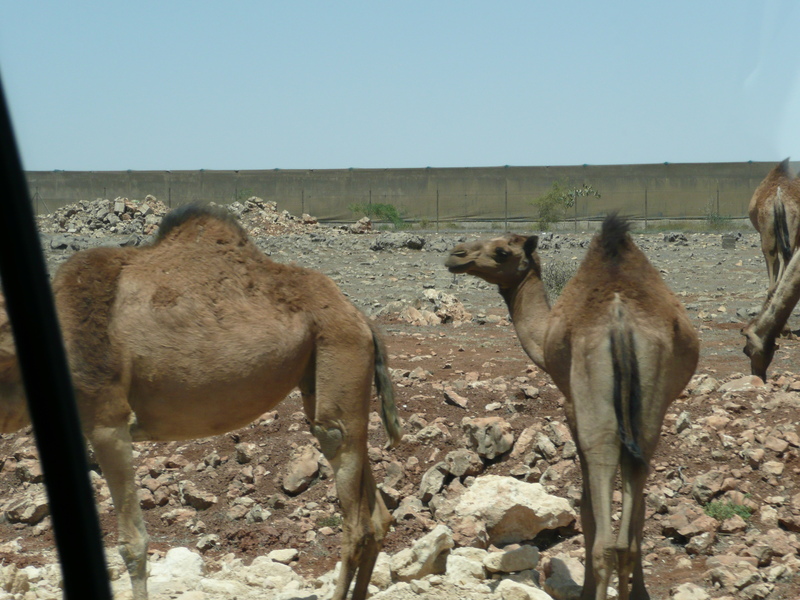 The camels just wander about by the road and on the road. The photo above is a single carriageway, and people will overtake if they want to go faster, even when it means overtaking someone who is already overtaking someone else like this, or around a blind corner, or if someone is coming the other way! 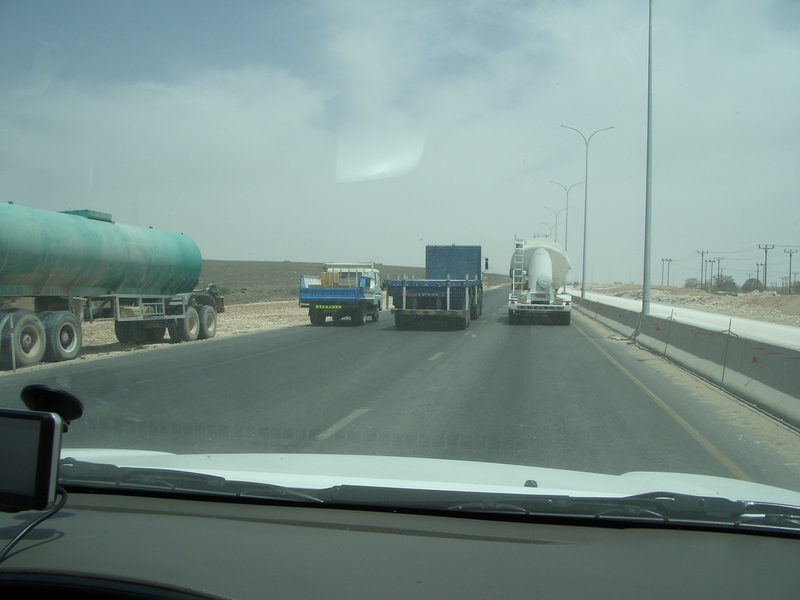 Due to accommodation issues at our working location we moved back to the Hilton that night and spend the week there doing the drive each day (about 60 to 75mins depending on camels and suicidal drivers). I managed two training sessions on the Monday, both in the hotel gym. 8k before work, 5k after work. Both were hard, and neither was fast. It was around 45 degrees C each day, and that drains you even though you train in a mildly air conditioned gym. I used the gym where I was working on both Tuesday and Wednesday. A basic gym, but two ergs and slightly better aircon than the hotel gym. I thought I’d try a proper interval training session. A tough session and a lot of sweating! Thursday 22nd: Time to start travelling back. After a bit of time walking on the beach in the morning it was the return of the outward journey. For the entire week out there the very real possibility of not being to get back was hanging over us. People having their flights cancelled because of the closed airspace back here in England were being stuck for up to 3 weeks before they could rebook on an alternative flight. 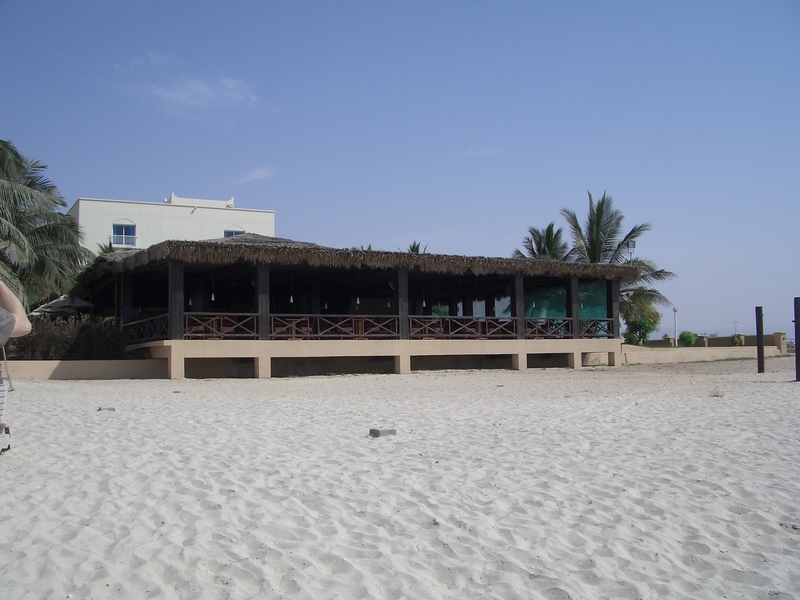 Salalah to Muscat, 4 hours in the airport, then on to Abu Dhabi and finally London and we were about the luckiest travellers getting back about 5mins earlier than our planned itinerary on Friday morning. Today has been a much earned rest day acclimatising back to the much colder UK temperatures and generally recovering from the week in the desert. Normal training will resume tomorrow. A steady 15k today aiming for the bottom end of 100k pace, so 1:52 / 25. It ended up being a nice gentle negative split from there, and just had to push it below 55mins at the end. Not quite as gentle as it was intended to be, but still a fairly gentle distance row overall. I generally find this the case when I don’t warm up at all before a moderate paced distance piece that it just feels easier as you go, so it’s hard not to negative split gently through the row. I put the c-breeze on today which made it a much more pleasant row, so I think it’s time to start using it on all the distance rows again. As I am going to be away for work for a while from later this week I want to make sure the last few days of training really count, as I don’t know what gym access I might have while I’m away. I felt good today, and fancied doing a hard middle distance row, so picked the 10k. I targetting a (too ambitious) 1:43 to 1:44 pace to set off at, which had to be revised during the first quarter of the row, and then abandoned altogether. The gym was hotter and much more humid than it’s been so far this year, so it was obvious by the levels of sweat inside the first 2k that the pace would not be sustainable. I decided at that point to “pyramid pace” it, ie get gradually slower through the middle, then speed back up towards the end. I decided rather than carry on what would end up being a very tough row to abandon it in favour of this month’s Cross Team Challenge instead through coming up to the 4min mark. Part of the motivation for this was that with the work trip away I wasn’t going to get another opportunity to try this during April. And therefore salvaged a reasonable training session out of the abandoned 10k attempt in the end. At the beginning of last week Graham Lay, another 30’s UK erg racer, rowed a 3:02.5 pb for the 1k. He commented that it put him at 14th position in the world rankings. I responded that it almost made me want to do a 1k to put him down to 15th, as a bit of a dig to the fact that there are lots of other people out there who could go faster. Graham’s response to that of “Pete – you’ve lost your speed mate but I’d love to see you try to go sub 3 mins again….you might actually find it painful” made me decide that I really should do it, and in doing so pace it in the way that I believe Graham needs to pace the 1k to get sub 3. So for this morning’s gym session I decided to do a sub 3 for 1k. 3500m warm up including 500m at 1:40 pace and 200m at 1:30 pace, then set 1k with 100m splits. Aim for pacing was to go hard for 7 strokes, drop to 1:31’s through the middle, then pick up the pace from about 200m to go to dip under 1:30.0 average at the end. The rate jumps around a lot with 100m splits depending where the strokes finish compared to the splits, but the middle 600m was mainly 34spm. At 130drag this felt good and controlled, and I wasn’t in doubt that I could pick the pace up enough in the final 200m to make the target. I don’t normally bother to enter anything in the online logbook or the world rankings, but put this in for a current 10th place position. A couple of people (myself included) commented in Graham’s blog about how we believed it would be optimal to pace the 1k, and Veronique made the very good point that restraint in pacing takes as much mental strength as killing yourself at the end of a row. Pacing something optimally requires knowledge of both your current potential and the confidence that you can deliver on that potential. Without that confidence and restraint you will always be tempted to either blast off thinking that getting a lead on the target will help later, or ease off too much in the middle because you don’t really believe you can do what you set out to do. I’m sure to some people both this blog entry, and doing the 1k today, will come across as arrogant. The main motivation was to illustrate to Graham how I believe he should pace the sub 3 1k next time he attempts it, as I have 100% confidence he is physically capable of doing this. I sensed a little bit of “you may have done sub3 before, but you can’t do it now and haven’t done it for a long time so you can’t remember how it feels” so needed to back up my advice with delivering the goods. Besides, arrogance is just another term for self confidence in your abilities, and that is a big component in achieving your potential in sports like this. With spring being here (for this weekend at least) I moved my erg from the garage to the patio for today’s steady distance training. Training outdoors is great, but it does have issues. I always make sure the erg is in the shade, because even in April the direct sun is enough to slow you down significantly. I always try to get the erg on as level ground as possible. I didn’t do very well at this today and was slightly “left hand down”, which resulted in more than half of my weight being on my left bum cheek – not ideal for longer training. The other main issue, which is just something to accept rather than being a problem particularly, is that wind causes a fluctuation is drag. As long as you don’t chase the split (which will vary as the wind varies during the stroke) it has a neutral net effect in the end, I believe. A steady distance piece at the lower end of pacing for the 100k. We now have three teams for the 100k – a 30’s mixed team (myself and Jen Howse), a 40’s mixed team (Jo Andrews and Steve Smith), and a 60’s male team (the current world record holders Joe and Gerry Keating). Jo and Steve are both people I’ve been coaching for some time, so I know their capabilities well, and know that they will do well at this challenge. Joe and Gerry are experienced having done this before, and Joe does a lot of endurance rowing. Jen also has done at least two solo 100k’s before, so really I am the unknown link when it comes to this type of endurance rowing. I had some great advice on training and nutrition from Tim Male. Unfortunately I have a week away with work between now and the 100k (on Sunday 23rd May), which really impacts training ideally for it, and I have the Farnborough 5k race the day before. During my week away working I’m not sure what gym access I might have, so I can’t plan how to approach that week. I hope to at least run during the week to ensure no CV fitness loss, but it really stops me implementing many of Tim’s suggestions. Also I really want to carry on the focus on the 5k and 6k, and so will approach the 100k from the angle that if I’m still in good 5k shape in 6 weeks time then the pace of the 100k is that much sub maximal that I will get through the majority of the distance before it gets tough. I’m not taking it too lightly, but I really do feel that the current record pace is a good distance below our potential, so it’s a matter of how ambitious we are at lowering the record, not whether we achieve it. Time will tell whether I’m right. I decided to do a pacing trial run for the pairs 100k to see if the sort of pace I’m thinking is about right. I had 2 hours to train, so just set 5mins / 5mins rest (the plan for the 100k) and set straight off, no warm up, to do as many reps as I had time for. The plan is for somewhere between 1:50 and 1:52, so I started at the slower end. Not bad after the 2 hour warm up. Where did that last rep come from? Back to the Danish intervals today as it’s been a while since I’ve done them. I had an enforced rest day yesterday as I’d been feeling tired and just lacking a bit of power on the erg for 2 days before. Not the best prep for the session either which was a 3+ hour drive back from my parent’s house with a stop for a McDonalds lunch at a motorway services. I didn’t expect a great deal from the session, so went with 750’s at the lower end of the Danish interval ladder. I knew as early as half way through the session that I was going to be able to do a fast last rep, it was just one of those days that it didn’t feel too hard. I had a quick look prior to the last rep back in my training diary to see what I’d done for the last rep on this session last time (1:37.2) so that I could try to beat that. It felt good right the way through the final rep. I started with 5 hard strokes then settled to 1:36’s, but on seeing I was still just under 1:35 average with 400m to go I picked the pace back up again to the end. If only every day could feel like this, but it seems the better I train the more lucky days I get. As I mentioned in my last blog entry Jen Howse and I will be making at attempt to beat the mixed tandem 100km world record on Sunday 23rd May. The record attempt will be taking place in the Velocity gym in the Village Hotel in Farnborough (Hampshire). I will try to put in a few specific training sessions over the next month to simulate the effort level that will be involved, but I don’t plan on erging for anywhere near the duration we will be doing on the record attempt itself. The current record stands at a little over 6hours33, and we will be aiming to put it under 6hours30 (1:57 pace). 1:57 pace might sound pretty slow, but we need to average that pace for 6 and a half hours, including changing over on a single concept2 rowing machine so it’s not a target we are taking lightly. All of the “at pace” reps were 1:50 / 25spm, with the slow one ranging from 2:01 to 2:14 for one where I got off the machine and stretched a little. I was feeling lacking in energy and generally tired during both sessions, despite them being slow and easy pace. This is clearly a consequence of doing 2 hard sessions on Friday, and therefore I am having an enforced day of complete rest today. Perhaps the biggest challenge for me in the 100k record attempt will be what and when to eat and drink to keep my energy levels up throughout the 6 1/2 hours or rowing. Doing “small team” 100k rows is very different as in a team of 10 you get much longer rests, and row for much less cumulative time. 3.25 hour of total rowing time over a 6.5 hour period, with only 5mins at a time to eat or drink anything need some more thought…. This week has been very busy at work, and it seems I haven’t updated my blog since last weekend because of this. A summary of the week’s training in reverse order, and then some news at the bottom about the Farnborough 5k event and some world record attempts that will be taking place there! Morning – a final attempt at this month’s concept2 challenge series – 16min19. I decided on a conservative approach to get the distance I needed to go one place up in the table (the most I could move up). The target was 4806m, so negative split to make the target. As you’ll see below I failed in an attempt to go faster than this a couple of days ago, hence the “easier” attempt today. Afternoon – I joined in with a rowpro interval set having not used rowpro for some time. It’s warm enough to train in my garage again, and rowpro always keeps it more interesting. The only issue with rowpro is that you intend to go easy and your competitive instincts take over. So some good quality metres in the end, but I couldn’t help wanting to beat the field of 8 on each distance, even though they were far from flat out pieces. 1:49.6 / 26 <– I put the handle down for a good 5 seconds! Tuesday I was too busy at work to train, and Monday was weights day. The weights on Monday was the reason the session on Wednesday was bad, as I had increased the weight on the squats and bench press, and was suffering from the after effects by Wednesday – still thinking long term though! Two bits of news about the Farnborough 5k competition – there are now prizes up for grabs for the fastest male and fastest female times in the 5k races of a free night stay in a village hotel anywhere in the country! The second bit of news is that on Sunday 23rd May, the day after the event, two world record attempts will be taking place. Both are tandem 100km rows (ie two people completing 100km on a single concept2 rowing machine in the fastest time possible) – one an over 60’s male team of brother Joe and Gerry Keating aiming to beat their own record set last year. The other is a team going for the overall mixed record, and that team will be me and Jen Howse. Jen I think was our fastest female in the 5k races at Farnborough last year, and the time we have to beat is 6hours 33mins and a few seconds. I’m confident we can beat this, though I have never attempted any sporting challenge of this type of duration before. I have done a couple of “small team” 100k rows before, but they are quite different being a team of 10, and therefore taking a fair bit less time. For this attempt not only will it take 2hours or so longer, but I will be rowing 5 times the distance! Wish us all luck, or better still if you’re in the area come and show your support!